Beautiful stone holiday home (120 m²) with beautiful tiles on the facade and inside the house. They are made by the owner and give the house a personal touch. There is a lovely secluded garden with garden furniture and electric BBQ under a pergola. Enjoy the peace and the beautiful view. The interior is spacious, simple but well maintained. The house consists of different levels. This estate sits atop the Montagne Ardéchoise. 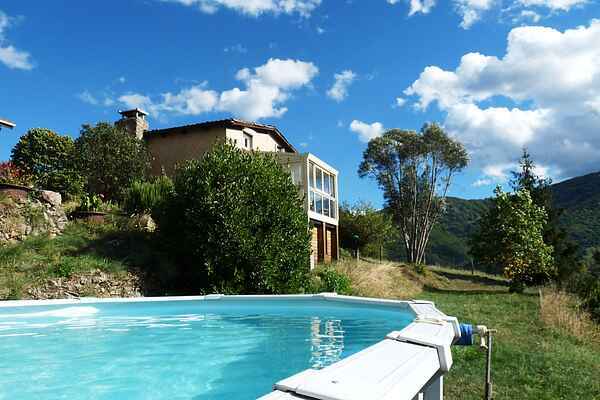 You detached house is peacefully located at the entrance of the estate at 700 m altitude. The views and the tranquility of this place will appeal to you immediately. The friendly and discrete owner and his wife live just behind the house (no visual contact). This is also where the shared ground swimming pool, that you can use upon request (in respect of everyone's privacy). For example, when returning from (walking) excursions through the densely wooded surrounding mountains. Marked trails start right from your home. Visit the Ray-Pic waterfalls (33 km) and the castle ruins of Rochebonne (12 km). The town Le Cheylard is located in only 5 km distance. It is comfortable here and you will find everything you need: including a market where many local products are offered.